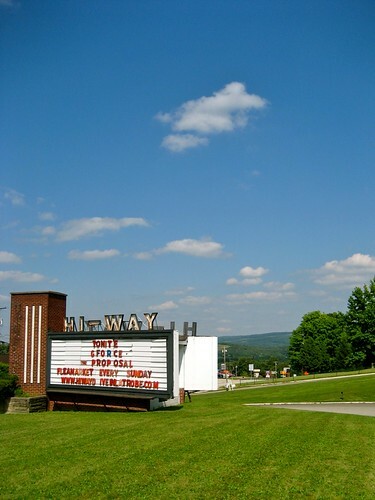 Just got the sad news from Brian Butko’s Lincoln Highway News blog that the Hi Way Drive In Theatre in Latrobe PA is going to be demolished and replaced by a CVS. So sad! 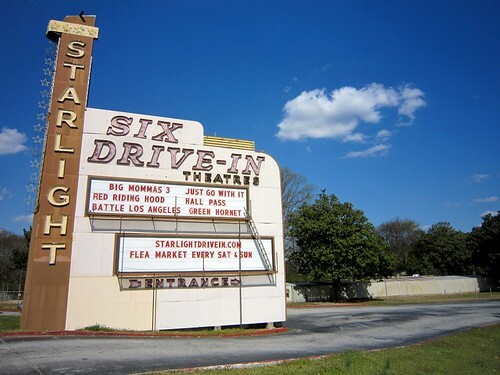 Atlanta GA Retro Roadmap Worthy Places – Drive In Movies, Classic Theaters and Colorful Neon! 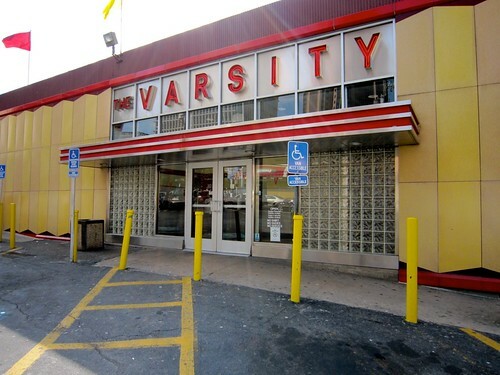 Here are some quick tips for vintage and retro roadmap worthy places in Atlanta GA – we wish we could’ve spent more time with ’em – but check them out for us next time you’re in the area! 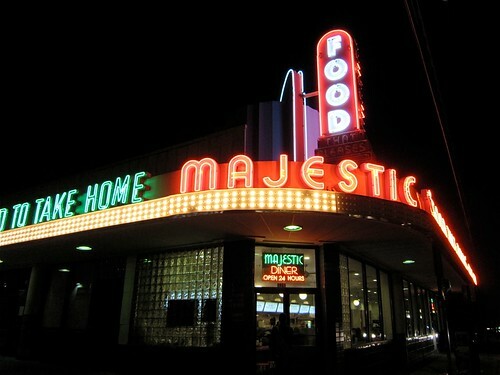 The interior of the Majestic has been recently re-done and the food was standard, but no one can deny the allure of their wonderful vintage neon signage and chasing lightbulbs. The Majestic “diner” has been serving “Food That Pleases” since 1929, and is open 24 hours a day, every day, ‘cept for closing on Christmas eve. They reopen the day after Xmas at 6am. The Starlight Six is Atlanta’s only remaining drive in movie theatre and I’m grateful to the folks at Drive-Ins.com for providing the background on The Starlight. If it weren’t for them we would not know that the Starlight opened in 1949 as a single screen DI and stayed that way ’til the 80’s when it went to a 4, then a 6 screen outdoor cinema. As you can read on the marquee they have flea markets during the weekend days. 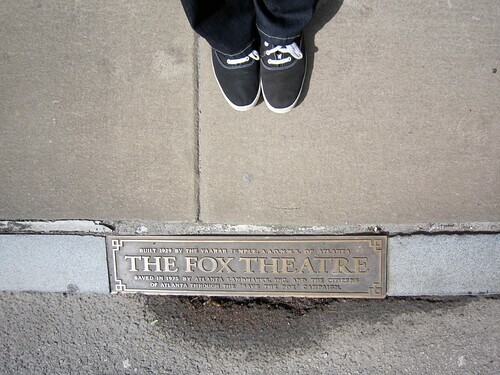 The Fox Theatre is in the heart of Atlanta and on the Register of Historic Places. Built in the pre-crash 1920’s the 4000+ seat Fox has managed to survive in part because of the citizens of Atlanta who rallied to save it from demolition in the 1970’s. I encourage you to read the interesting history of this classic venue here on their website or on the Fox Theatre’s Wikipedia page. 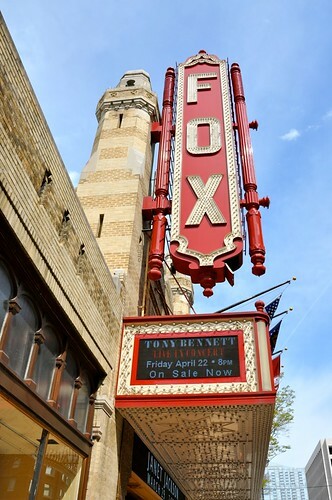 Even if you don’t read a word of it, do yourself a favor and check out the Fox’s schedule if you’re ever in the area and see a show at this grand old theatre. Just because we didn’t get to spend enough time in Vintage Atlanta doesn’t mean you can’t – now that we’ve given you a head start you can plan your fun around these great old time places! And of course we’ve added them to the RetroRoadmap to make it easy peasy to find ’em next time you’re in ‘lanta. 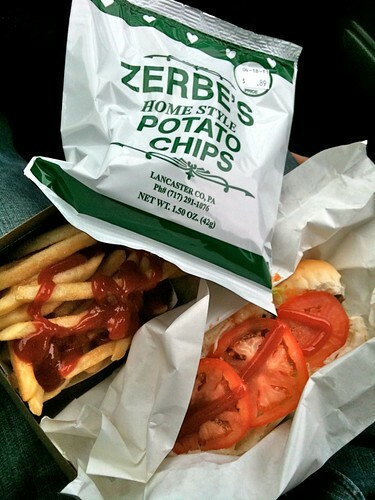 RetroRoadhusband and I started our Retro Road Trip off in perfect fashion – with lunch at Boehringer’s Drive In Restaurant in Adamstown PA, just minutes off the Pennsylvania Turnpike. It was the opening day for their 75th season in business! We here at RetroRoadmap initially visited Boehringer’s a few years ago, and love this family owned seasonal stop right up the road from some great antique shops in Adamstown. I had been waffling (mmmm….waffles) between ice cream or cheeseburger, but when we got out of the car and it was so danged cold I knew I was going to order something warm. RetroRoadhusband got some practice in not eating the food before I photographed it!He got a cheeseburger sub, on a long roll with lettuce and tomato. 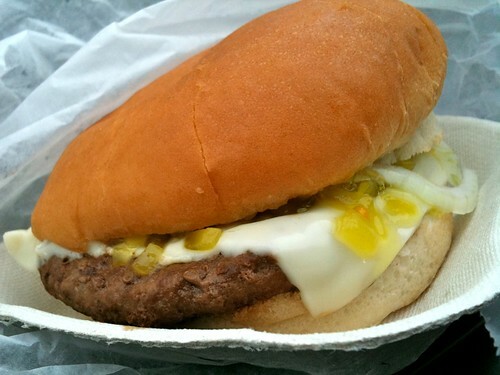 I loved the little tray my cheeseburger came on, and the fact that my burger was loaded with relish, cheese, ketchup, mustard and onions. Perfecto. Thanks to a post on American Road Magazine’s facebook page I found out that some meanies broke into the Chief Drive-in movie theatre in Chickasha, OK trashed the place and stole a buncha stuff. The Chief Drive In was built in 1949 and is one of the last standing Drive-Ins in the state of Oklahoma. There’s info below on what happened and how you can help. *Announcement* Someone broke in and destroyed the concession stand and vandalized the box office. They stole almost all of our supplies, candy, pop, golf balls, and ruined all of our food in the freezers. They also stole our sound system including all of the speakers. They stole almost everything including our jump box and all trash cans. We will try to have it back up and running by next weekend. We will keep you informed. You can now donate on our site. Also you can mail any donations to Arvest Bank in care of The Chief Drive In 1927 S. 4th Chickasha, OK 73018. Here’s a link to their Facebook page if you want to add them to your faves as well. 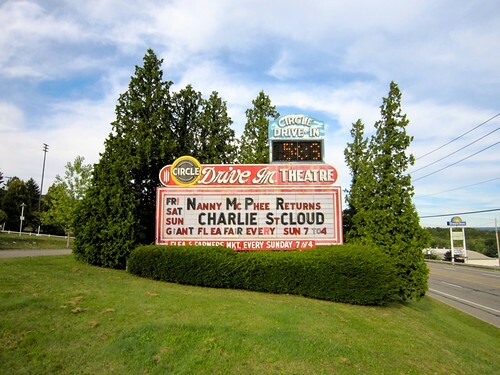 Circle Drive-In Theatre Dickson City, PA – Get Around To Going Here! 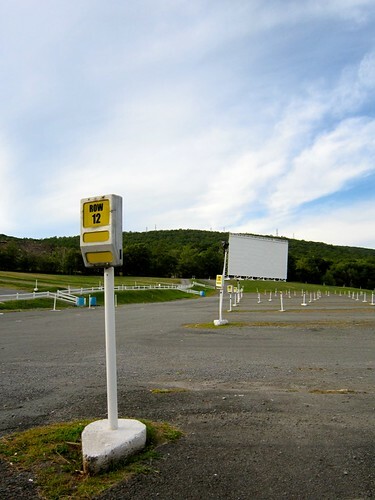 By popular request here is the Circle Drive-In Movie Theatre, located in Dickson City PA (just north of Scranton). Thanks to all of the Retro Roadmap Readers who wanted to hear about this place, it’s a good excuse to bump this seasonal business to the top of the writing list, since drive in days are quickly drawing to a chilly close here up north. 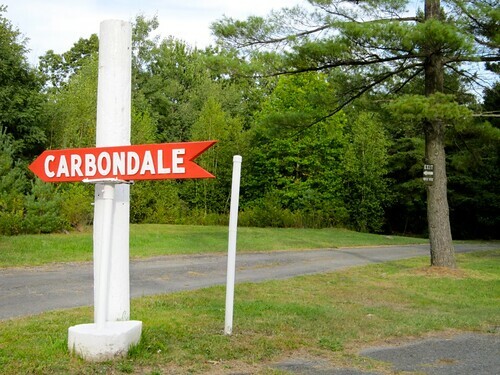 This year marks the 61st consecutive season of operation for this majestic drive in carved into the hillside on the Carbondale Highway (also known as Route 6 / Business). From April – October you can see two movies for the price of one on Friday, Saturday and Sunday. While I was there on a Saturday it was still too light to go to a movie (and I wasn’t going to go to the movies on my lonesome) so I took a quick peek around. As you climb the hill to get to the theatre, you pass through the ticket booth which is almost like a colonial style “porte-cochere” where you can admire the view of the city below as you buy your tickets. This single screen drive in has room for 800 cars and operates with a radio signal to get the sound to you in your vehicle. 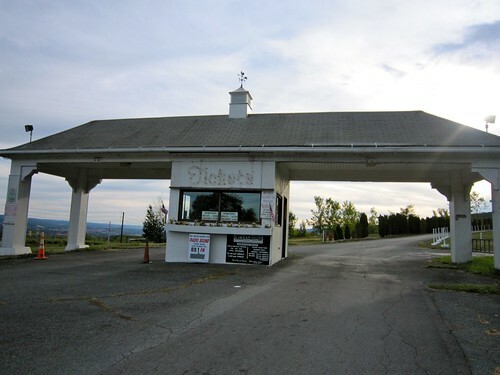 This room for cars is also put to good use every Sunday morning from March to November, where the Circle Drive-In is home to Northeastern Pennsylvania’s largest flea market “flea fair”, swap meet and farmer’s market! Open from 7am-4pm admission to the fleafair is a bargain at 50 cents A CAR! The snack bar is open to serve snacks and also provide bathroom accommodations. Sounds like a great way to spend a Sunday morning, if you ask me! I’m hoping the Circle Flea Fair is open when Retro Roadhusband and I head up to Scranton for the Roadbloggers Meetup in November. More about that coming soon, stay tuned! Shankweiler’s Drive In of Orefield PA had already made it onto the Retro Roadmap as America’s Oldest Drive In Movie Theatre (since 1934), but I couldn’t resist sharing a few photos from the visit Retro Roadhusband and I made this past weekend. Now that we’ve been there personally I totally recommend the drive-in, as a fun place to bring the family and enjoy a movie under the stars. OK so I didn’t ask about the cement lion sculptures that flank the entrance to Shankweilers- Penn State’s Nittany Lions, maybe? There’s also one of these on the other side of the big brick building on the other side of the entrance.If you’ve got the scoop then share it with us! 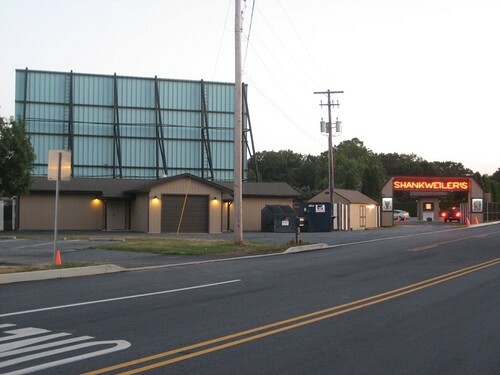 The theatre is a quick left off of the main drag of route 309 in Orefield, hard to miss! While we were waiting for our feature (Toy Story 3, my pick, loved it, got all teary-eyed at the end, if you must know) one of the cool surprises for me was the fact that their introduction to the previews of coming attractions was the exact same one as they had in our local movie theater when I was growing up! I totally remember that pinky purply color and know that back in the day that tidbit of music was pretty darned slick. 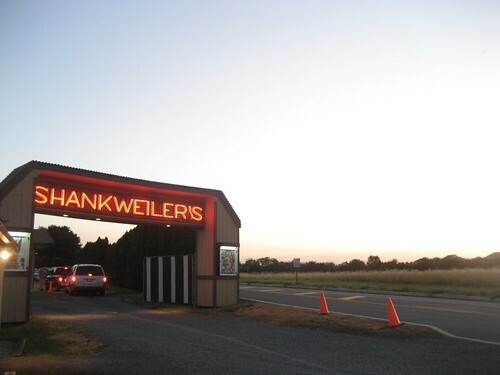 Clean, friendly, double feature – no reason not to go to Shankweiler’s Drive in, no sireee, except if you happen to be going to Becky’s Drive in, which is our next stop!